India have been bundled out for 162, 107 and 130 in their last three innings. Those don't make for pretty numbers, do they? After a good start at Edgbaston, the lack of fight towards the end was galling. And India's abject surrender at Lord's was a bitter disappointment. England did have the better of the conditions, but they made the most of the assistance they received, especially when it came to batting. India, however, did not take the chances that came their way. In their last 10 overseas innings, India has topped 250 only twice, and on both occasions, Virat Kohli made big hundreds. That doesn't reflect well on a batting line-up that has played previously in England and is aware of what to expect. As much as the technical inadequacies, the thing that stood out was the lack of self-confidence. Once you start doubting your abilities, there's no way back. India have the resources - from a cricketing perspective - to fight back from 2-0 and make it 2-3 by the end of the tour. But do they have the belief? England have a top-class bowling attack with standout performers in James Anderson and Stuart Broad. In the first innings, when the ball was swinging, they bowled fuller lengths, and when swing wasn't available in the second, they hit the deck and relied on their cutters. India might have an excuse for their failure in the first innings, but they should have done much better in the second. Pacer Jasprit Bumrah is likely to be available for selection during the third Test. He was supposedly fit even before the Lord's match, but the management wanted to give him more time to recuperate from his finger injury. Unless the Trent Bridge track has something special on offer for the spinners, Kuldeep will probably make way for Bumrah. Also, the talented wicketkeeper-batsman Rishabh Pant wouldn't have been on the plane if Wriddhiman Saha was fit. The way things are shaping up though, it won't be a surprise if he ends up making his debut at Nottingham. No batsman other than the skipper Kohli has done well enough, but the hatchet could fall on Karthik for one mild reason that there's a replacement ready in Pant. Karthik has scores of 0, 1, 20 and 0 in the four innings that he has played. Pant, with a first-class average of 54.50, scored 34 in the practice game against Essex, and Kohli might just bet with the new boy. Either way though, right now it seems the Indians are dependent on fate rather than their own abilities. That is something the team management must address quickly before the Nottingham encounter. The management should also be flexible with the team selection. 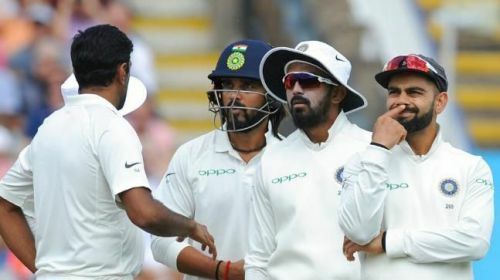 At the toss on the second morning at Lord's, with clouds gathering and the conditions crying out for a third specialist seamer, India left out Umesh Yadav and brought in Kuldeep. Such mistakes are unpardonable in a series of this magnitude. And what is also unpardonable is the lack of fight and self-belief shown by the Indian players so far. Can they turn it around in Nottingham? I wouldn't bet on it.